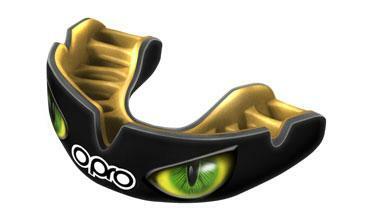 The OPRO Bronze Adult Mouthguard provides protection to your teeth and gums whilst participating in combat sports. What is the OPRO Bronze UFC Mouthguard? The Bronze UFC gum shield is the training level and entry level mouthguard in the OPRO Self-Fit range. Made using a single layer construction, it still provides good protection for the wearers teeth whilst still offering a great fitting mouthguard. The Bronze mouthguards also come with special stretch zones that adapt to the contours of your mouth during the fitting process. How easy is it to fit an OPRO mouthguard? Very easy! All OPRO mouthguards come with fitting instruction in the pack, or you can follow our easy to follow fitting video. Once fully immersed into hot water, the fins soften so that when you bite into them, they mould to the unique contours of your mouth and teeth. This leaves you with a mouthguard that stays in place comfortably and protects like only an OPRO can. Ordering your OPRO UFC Bronze mouthguard online from OPROMouthguards.com is simple, secure and fast. Remember that when you place your order by 3pm on any working day, you could start using your mouthguard from as early as tomorrow afternoon! Receive a 15% off promo code for your order on OPROMouthguards.com. Want a chance to win? Tick this box if you're interested in taking part in surveys to help improve our website and products. By clicking sign up above, you're consenting to receiving updates about products and services, promotions, special offers, news and events from Opro. * Custom-Fit Mouthguards are excluded from all promotions.